These General Terms and Conditions (“GTC”) govern the contractual relationship between the customer and Zürich Tourism (an association with its headquarters at Stampfenbachstrasse 52, 8006 Zurich, Switzerland, registered in the commercial register of the canton of Zurich under the number CHF 105.846.358) regarding services where Zürich Tourism itself is acting as the provider/organizer (e.g. guided city tours, sale of Zürich Tourism merchandise, accompanied shopping). These GTC must be accepted when the customer places an order. The specifics are governed in section III below. Where Zürich Tourism arranges the services of third parties (e.g. hotel reservations, city tours, excursions, tickets for events), the contract is concluded between the third party in question and the customer. The third party is specified on the website of Zürich Tourism. Even if the entire order process is handled by Zürich Tourism, this merely represents a provision of information by Zürich Tourism. Where a third-party service is arranged, the general terms and conditions of the third party that is expressly identified as the contractual partner in the offers apply in every case. Zürich Tourism does not act as an intermediary in disputes between the customer and a third party. The specifics are governed in section IV below. Zürich Tourism operates the website www.zuerich.com (the “Website”). It offers its own services on the Website (see section III). Additionally, Zürich Tourism allows third parties to offer their own services on the Website (see section IV). Zürich Tourism is not obligated to establish or maintain a data connection between the IT system of the visitor to the Website and the transfer point (i.e. the interface between the data network operated by Zürich Tourism and other networks). All of the content on the Website of Zürich Tourism serves merely as general information. 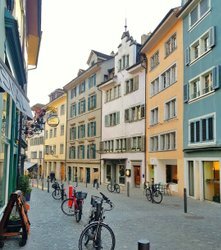 Zürich Tourism strives to ensure that the content is accurate, up to date and free from errors, and that it does not infringe any third-party rights. Should damage that does not represent an injury to life, limb or health arise from the use of the Website, Zürich Tourism can only be held liable if it acted with intent, malice or gross negligence. The operating hours of the Website are midnight to midnight from Monday to Sunday. The Website is a free service and is provided subject to availability. Zürich Tourism endeavors to provide the Website to the user without disruptions. However, use of the website might be restricted or temporarily disrupted by maintenance work, development or other disturbances. Zürich Tourism is therefore not liable for the uninterrupted availability of the Website. If a disruption does occur, the user cannot derive any claims for damages from this. Zürich Tourism is neither responsible nor liable for the content or functionality of third-party websites to which its own Website contains links. It has no influence over the content of such websites. The customer views these websites at their own risk. Users are forbidden to use automated systems, mechanisms, scripts, software and/or other methods that send automated inquiries to the servers of Zürich Tourism. 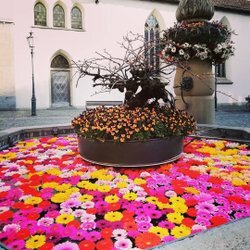 Where Zürich Tourism itself acts as the organizer of guided city tours or any other services, the contract is concluded between Zürich Tourism and the customer. The presentation of goods and services on the Website of Zürich Tourism does not represent a legally binding offer but rather a non-binding online brochure (an invitation to make an offer). A binding offer is only made when the customer provides all necessary data for the execution of the contract, indicates their acceptance of the GTC and any terms and conditions of cancellation and clicks the button “Book now”. Until they click that button, the customer can add products and services to their basket without obligation and change their data at any time. Placing the order represents the customer offering to enter into a contract. The customer will then be provided with confirmation that the order has been received (by phone, in writing, by email or a system message). This confirmation does not represent acceptance of the offer; it merely confirms that the order has been received by Zürich Tourism (confirmation of receipt). The contract only comes into existence when Zürich Tourism accepts the customer’s offer and provides the customer with express confirmation of the order (i.e. an order confirmation). If the customer has merely provided a non-binding order inquiry by phone, in writing or by email, the response of Zürich Tourism represents a binding offer to enter into a contract. In this case, the contract comes into existence when the customer explicitly signals their acceptance. Zürich Tourism undertakes to duly perform the services it owes under the contract. If fulfillment of the contract becomes impossible for reasons for which Zürich Tourism is solely responsible or is annulled by Zürich Tourism, any payments already made by the customer shall be refunded. Any outstanding receivables owed to Zürich Tourism by the customer as part of the annulled booking shall be canceled. This applies even if the fulfillment of the contract becomes impossible for reasons for which Zürich Tourism is not responsible or is annulled by Zürich Tourism, and the customer produces evidence that they are also not culpable. If the customer cancels a service, the terms and conditions of cancellation of Zürich Tourism apply. The customer shall be made aware of the terms and conditions of cancellation as part of the order process; the order renders the terms and conditions of cancellation a component of the contract. In the cases specified in this section in which it acts as an organizer, Zürich Tourism can be held liable for intent and gross negligence. Liability for ordinary negligence and for vicarious agents is excluded. Under no circumstances can Zürich Tourism be held liable for personal fault on the part of the customer or for third-party culpability. Liability for lost profit or other direct or indirect consequential damage is excluded. With regard to consumers who are habitually resident in a Member State of the EU, in the cases mentioned in this section where it is acting as an organizer, Zürich Tourism can be held liable without restriction for damage caused by Zürich Tourism or its vicarious agents through intent or gross negligence, for culpable injury to life, limb or health, and under the relevant mandatory provisions regarding liability. In the event of an infringement of material contractual obligations through ordinary negligence, the liability of Zürich Tourism is limited to the typical foreseeable damage as at the conclusion of the contract. Material contractual obligations are duties that must be fulfilled in order for the contract to be duly executed and on the fulfillment of which the customer can normally rely. Zürich Tourism cannot be held liable for the infringement of non-material contractual obligations, even if the damage suffered by the customer was effected by the customer or a third party for whose culpability Zürich Tourism is not responsible under the statutory regulations. The customer is solely responsible for securely storing valuables at events organized by Zürich Tourism. Where Zürich Tourism arranges third-party services (e.g. hotel reservations, etc.) by publishing the offers of the third party on its Website, the contract concerning the service of the third party is concluded between the customer and the third-party organizer. Zürich Tourism does not become a party to that contract. Such services are therefore subject to the general terms and conditions of the third party. Besides the general terms and conditions of the third party, these GTC apply if it is a question of the use of the Website itself and the conclusion of the contract with the third party through the Website. In this case, the customer is therefore subject to the general terms and conditions of the third party as well as these GTC. In the event of a conflict between the two documents, the provisions of the general terms and conditions of the third party take precedence with regard to the purchase agreement between the customer and the third party. The presentation of goods and services of a third party on the Website of Zürich Tourism does not represent a legally binding offer but rather a non-binding online brochure (an invitation to make an offer). A binding offer is only made when the customer provides all necessary data for the execution of the contract, indicates their acceptance of these GTC and clicks the button “Book now”. Until they click that button, the customer can add products and services to their basket without obligation and change their data at any time. Placing the order represents the customer offering to enter into a contract with the third party. The customer will then be provided with confirmation that the order has been received (by email or a system message). This confirmation does not represent acceptance of the offer; it merely confirms that the order has been received by Zürich Tourism as the broker (confirmation of receipt). The contract with the third party only comes into existence when the offer of the customer is accepted by the third party or Zürich Tourism acting on the third party’s behalf and the customer is sent an explicit order confirmation. If the customer has merely provided a non-binding order inquiry by phone, in writing or by email, the response received by the customer represents a binding offer to enter into a contract with the third party. In this case, the contract with the third party comes into existence when the customer explicitly signals their acceptance. As the contractual partner of the customer, the third party is solely responsible for the fulfillment of the contract. The general terms and conditions of the third party are authoritative. Zürich Tourism makes absolutely no guarantee that the contract will be fulfilled correctly by the third party. Any and all complaints are to be directed to the third party immediately and exclusively. Where available, the terms and conditions of cancellation of the third party, as accepted by the customer when submitting the query or placing the order, are authoritative. 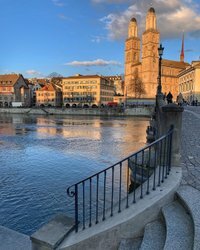 Zürich Tourism cannot be held liable for damage suffered by the customer in connection with the service of the third party. Any claims for damages are to be filed against the third party. In this context, for example, the provisions in the general terms and conditions of the customer apply. Unless agreed otherwise in writing, selected debit and credit card payments and on-site cash payments can be accepted on a case-by-case basis. If the customer pays by credit or debit card, they must provide us with their card data when placing the order. Once authenticated as a lawful card holder, Zürich Tourism shall instruct the card company to initiate the payment transaction as soon as it receives the order. The credit or debit card company shall process the payment transaction automatically and charge the amount to the card. Zürich Tourism reserves the right to issue an advance invoice for confirmed services. All prices are in Swiss francs and include statutory VAT. With regard to on-site cash payments, the price in Swiss francs can also be paid in euros on the basis of the current exchange rate. However, the customer has no legal entitlement to pay in euros. The prices indicated do not include delivery costs. During the order process, the customer shall be notified of delivery costs separately. All intellectual property rights (especially copyrights, trademarks, design rights and patents) to the content of this Website are reserved. The protected elements are owned by either Zürich Tourism or a third party that has consented to the use of the element by Zürich Tourism. Visitors to the Website are not granted ownership of or licenses to elements of the Website or software, especially licenses to content protected by copyright or a trademark. The content and all elements on the Website may only be downloaded or printed if no copyright notices or other protected designations are removed and if the source is cited. Zürich Tourism expressly reserves all rights. The Website may not be reproduced, transmitted, modified or used for public or commercial purposes, either fully or in part, without the prior written consent of Zürich Tourism and without the full citation of sources. If any provision of these GTC should be ineffective, either fully or in part, it shall be replaced by an equivalent provision that best approximates the economic value of the ineffective provision. This does not affect the effectiveness of the remaining provisions. Zürich Tourism reserves the right to amend these GTC at any time. The applicable version is published on this Website and applies to orders made after the date of its publication. The applicable version when each order is placed is authoritative. The contractual relationship between Zürich Tourism and the customer is exclusively subject to Swiss law, excluding the UN Convention on Contracts for the International Sale of Goods. Additionally, consumers who are habitually resident in a Member State of the EU are subject to the mandatory consumer protection provisions of that Member State. A mandatory place of jurisdiction notwithstanding, disputes between Zürich Tourism and the customer shall be heard by the courts at the registered office of Zürich Tourism. For consumers who are habitually resident outside of Switzerland, the place of jurisdiction is determined by the relevant statutory regulations.